Two scientists from the State Herbarium of South Australia have recently collaborated with colleagues to produce research papers that were published in well-known Nature Research journals during the last week. 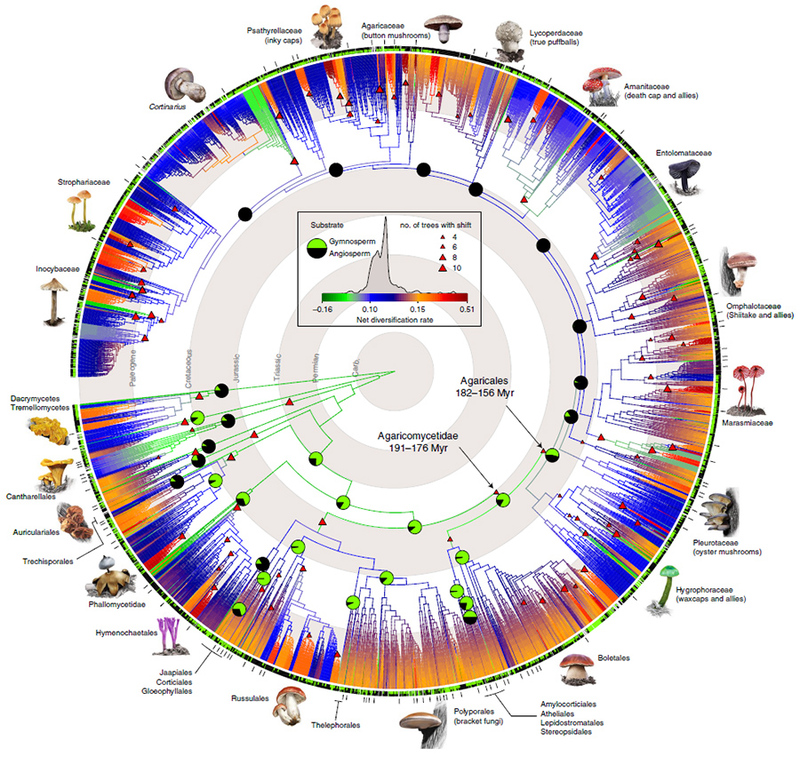 (1) T. Varga, et al., Megaphylogeny resolves global patterns of mushroom evolution. Nature Ecology & Evolution (16 Mar. 2019), DOI: 10.1038/s41559-019-0834-1. Hon. Research Associate Pam Catcheside is among 62 authors, collaborating in this global effort to produce a phylogeny of 5,284 species of Agaricomycetes. These mushroom-forming fungi have the greatest morphological diversity and complexity of any group of fungi. They have radiated into most niches and fulfill diverse roles in the ecosystem, including wood decomposers, pathogens or mycorrhizal mutualists. This ground-breaking, first comprehensive phylogeny of mushroom-forming fungi reveals large-scale patterns of their evolutionary history. Phylogenetic relationships and diversification across 5,284 mushroom-forming fungi. A maximum-likelyhood analysis of nrLSU, rpb2, ef1-a sequences. (2) J.M. Kalwij, et al., Vagrant birds as a dispersal vector in transoceanic range expansion of vascular plants. Scientific Reports (15 Mar. 2019), DOI: 10.1038/s41598-019-41081-9. Some years ago, State Herbarium botanist Jürgen Kellermann was contacted by Jesse Kalwij (now working in Germany) to identify an unknown shrub that was discovered about 25 years ago on sub-Antarctic Marion Island, one of the two Prince Edward Islands (South Africa). This evolved into a study examining the pathways that lead to the establishment of the plant, which turned out to be Ochetophila trinervis, a shrub in the family Rhamnaceae (see also this article). The species is native to southern South America, the closest population being over 7,500 km away. Dr Kalwij involved colleagues from South Africa, Australia, Argentina and Germany in this research, identifying the barn swallow as the most likely vector dispersing seeds of the plant to this sub-Antarctic island. Ochetophila trinervis on Marion Island. (a) The single shrub, c. 25 years after establishment. (b) Close-up of branch of the plant. Photos: J.M. Kalwij. This entry was posted in News on 19 March, 2019 by Jürgen.